With the recent uncertainty surrounding the FCC and import radios, TYT has made a decision to ship all of their radios locked down to the 150-160 MHz VHF and 450-460 MHz UHF ranges. They actually made these changes a few months ago, and at first "unlocking" the radios to allow use outside of these limited ranges required special unlock software. With the most recent firmware release, however, TYT has made the unlock process much more simple. All of their models can now be unlocked by holding down a key combination while powering on the radios. In this article, we'll show how to unlock the TYT MD-9600 mobile radio, and the MD-380, MD-390, MD-UV380 and MD-2017 handheld radios. Radios that are locked will display frequencies outside of the 150-160 MHz and 450-460 MHz range as 150.000 or 450.000 when the radio is in frequency mode. For example, if the channel on a locked radio is programmed for 147.300, the display will show 150.000. Once unlocked, the radio will show the correct frequency. A locked radio that has been programmed to frequencies outside of the locked range does not need to be reprogrammed. After being unlocked, the radio will work properly. A radio will always remember that it has been unlocked, even if the battery or power supply is removed. The TYT MD-9600 must be running firmware version 6.09 or higher to unlock using these steps. Prior versions will need special unlock software. Remove all power to the radio. Note, you must remove vehicle or power supply power - you can't just turn off the radio with the power button. Hold down the P1 and P2 buttons on the front of the radio. Power up the radio while holding these buttons until the power on tone sounds. No notification/confirmation is provided, but the radio is now unlocked. The TYT MD-2017 must be running firmware version 4.06 or higher to unlock using these steps. Prior versions will need special unlock software. On the side of the radio, hold down the top (blue) button and the UP arrow key. Turn the radio ON while holding down these buttons. The TYT MD-380 or MD-390 must be running firmware version 14.07 or higher to unlock using these steps. The MD-UV380 requires version 18.03 or higher. Prior versions will need special unlock software. Hold down side buttons 1 and 2. Why did TYT do this? Great question, and one that we can't get a clear answer to. Based on our understanding of the FCC rules, TYT should be able to ship the radios as long as their supported range is within what is allowed on the grant from the FCC. For the MD-2017, for example, the grant shows 136-174 MHz and 406.1-480 MHz. I can only assume that this has been done out of an overabundance of caution. It would be understandable if they were unsure about how the FCC will be enforcing the rules, and don't want to take any risks at all. In the meantime, unfortunately, customers are confused and left with products that look to be defective, although they are actually operating as designed. 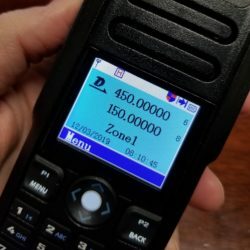 This entry was posted in Ham Radios, Tytera and tagged programming, TYT, MD-2017, MD-UV380, md-380, MD-9600, MD-390 on March 13, 2019 by danny. We’ve already done an introductory video on the Motorola DTR600, but we knew we needed something more. Now, we’re going to go more in depth and show you how to program the DTR600 and DTR700 digital radios using Motorola’s PMKN4154A programming cable (available in a kit as HKKN4027A) and free CPS PC programming software. In this video, we’ll install and setup the software, connect the radio to our laptop, read from the radio and create a profile in the software, create contacts and groups, write that profile back to the radio, and then we’ll go back discuss some of the features that are configurable using the software. The topics covered are listed below. You can watch the entire video or go to a specific section. This entry was posted in Videos, Motorola and tagged Motorola, video, programming, DTR600, DTR700, tutorial on February 25, 2019 by Rick. 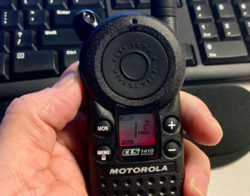 If you're changing the frequency on your Motorola CLS series radio, you're going to quickly realize that the radio doesn't show you the actual frequency. Instead, it allows you to select a number between 1 and 56 that relates to a frequency. For example, if you need frequency 467.900, you'll want to select frequency number 7. To save you from having to dig through the CLS owner's manual, we've listed the frequencies along with their reference number in the chart below. This chart was intended for the Motorola CLS1110 and CLS1410, but it also applies to other radios, including the Spirit M, GT, and S-Series. You may also want to view the default frequencies for Motorola CLS series radios. This entry was posted in Articles, Motorola and tagged frequencies, Motorola, CLS1110, CLS1410, programming, frequency table on February 5, 2019 by danny. When checking the search history for the Buy Two Way Radios web site, it's fairly common to see searches similar to "How to program a CLS radio" or "How to change frequencies on a CLS radio". Well, today I decided to actually check those queries for myself and was surprised to find that we didn't have an article about it! Shame on us, but better late than never I suppose! The frequency assigned to each channel (from a list of 56 available frequencies). The CTCSS/DCS code assigned to each channel. Also called a privacy or interference eliminator code. The selected call tone, or activating the vibrate alert (CLS1410 only). The channels scanned when scan is activated (CLS1410 only). The number of channels supported (up to 4 - CLS1410 only). Each of these features is activated by first placing the radio in "programming mode" and then navigating to the setting in the menu that appears. Since most likely you're only here to find out how to change one of those settings above, I'll provide separate instructions for how to enter programming mode and how to change each setting. Let's get started! Be sure the radio is OFF. Press and hold the Push to Talk (PTT) button and the MON button. Turn the radio on while continuing to hold PTT and MON. After 3 seconds, you should hear a tone and see a "PROG" icon on the display. Enter "Programming Mode" using the instructions above. CLS1410 only: Select the channel number that you would like to change the frequency for. Immediately after entering programming mode, the channel number will flash and you can use the plus and minus keys to change it. Press the plus or minus buttons to select the number of the frequency that you would like. Click here for the list of all CLS series frequencies. Click here for the CLS series default frequencies. Press Push to Talk (PTT) to exit, or MENU to continue programming. Press the plus or minus buttons to select the number of the code that you would like. If you know the specific code that you need, refer page 56 in the manual for a cross reference. Press the plus or minus buttons to select the number of channels that you would like to be available on the radio. The maximum (and default) number of channels is 4. Press the plus or minus buttons to select call tone 1-3. Call tones can be turned off by selecting "0" (this is the default). CLS1410 users can activate the vibrate alert feature (VibraCall) by selecting call tone 4. Press the plus or minus buttons to gain levels 1-3. Level 1 is the least sensitive, for loud environments, and level 3 is the most sensitive, for quiet environments. Level 2 is the default. The large blinking character to the left is the channel number, and the character to the right is a "y" or "n" to indicate if the channel is scanned ("y" is yes, "n" is no). Press the plus or minus buttons to select the channel, and the MON button to toggle between "y" or "n". This entry was posted in Business Radios, Motorola and tagged Motorola, CLS1110, CLS1410, programming on January 30, 2019 by danny. The Wouxun KG-UV950P quad band mobile two way radio has all the great features of the popular KG-UV920P-A dual band mobile radio, and more, two bands more, to be precise. It transmits and receives on the 2 meter (144-148 MHz), 70cm (420-450 MHz), 6 meter (50.1-54 MHz) and 10 meter (28.3-29.7 MHz) amateur radio bands. This is a great transceiver for hams who want access to multiple bands without paying through the nose to get on the air. Like the the KG-UV920P-A, the KG-UV950P has cross band repeat capability for even greater functionality. It also makes a nice base station radio when connected to the Wouxun SPS31WIN or similar power supply as shown in the Wouxun KG-UV950P Quad Band Amateur Radio Unboxing video. Programming The Wouxun KG-UV950P is the same as programming the KG-UV920P-A. You can do it direct from the console on the front panel of the radio, from the DTMF keypad on the speaker microphone, or through a PC using the Wouxun KG-UV950P programming software. If you know how to program frequencies into the KG-UV920P-A, the UV950P will be old hat. If you haven't programmed a UV920P-A, or you are new to programming a two way radio, you will need to read the manual carefully and keep it with you for reference until you get the hang of it. The manual is not very intuitive, especially when explaining some advanced features, but it sure beats reading the original manufacturer's user guide for the Baofeng UV-5R, which is widely regarded in the ham radio community as one of the worst operating manuals ever written for an amateur radio of this century. While this latter point is not particularly inspiring, it may be of some consolation if you have trouble getting through the Wouxun manual. Compared to Baofeng, the Wouxun owner's manual is a literary masterpiece. The KG-UV950P menu consists of 50 items compared to the menu options of the KG-UV920P-A, which has 45 menu options. Default settings are bold. The KG-UV950P uses the same USB programming cable as the KG-UV920P-A, so if you already have one, you are halfway there. If you don't, you will need the PCO-003, which includes the Wouxun cable driver and programming software CD when purchased from Buy Two Way Radios. Simply follow the Wouxun KG-UV920P-A cable driver installation instructions and the programming cable should be set to go. Unlike the programming cable, the Wouxun KG-UV950P programming software is specific to the radio and is currently available for Windows PCs only. If you have the programming software for the KG-UV920P-A, it will not work with the KG-UV950P. If you purchased the programming cable from Buy Two Way Radios, the KG-UV950P software will be included on the cable driver and programming software CD. It is also available as a free download. Working the KG-UV950P is almost exactly same as operating KG-UV920P-A. The only real difference is the layout of the console and redesign of the speaker microphone. While the key layout is the same on the consoles for both models, the location of the speaker mic jack is not. The speaker microphone plugs into the front of the KG-UV920P-A; on the KG-UV950P, the jack is located on the side of the front panel. The location of everything else on the front panel is the same. The LCD display with a selectable three color backlight, channel knobs, volume knob and DTMF keys, they are all there. As a quad band radio alone, the Wouxun KG-UV950P is a great value. As a mobile/base station radio or cross-band repeater, it can add affordable versatility to any ham shack. This entry was posted in Wouxun and tagged programming, Wouxun, KG-UV920P-A, menu options on June 27, 2016 by Rick. The Wouxun KG-UV920P-A dual band mobile two way radio is a popular choice for ham radio operators who want to go mobile on the 2 meter (144-148MHz) or 70cm (420-450MHz) amateur radio bands without burning all the cash needed to get around town. But there's a lot more to this mobile than just the transceiver. The KG-UV920P-A also has cross band repeat capability, which means you can have a mobile repeater in your vehicle on demand. It can even become a base station radio when connected to an AC power source and mounted to a wall or desk, as depicted in this unboxing video. The typical mobile radio can cost hundreds, without premium features. Investing in the KG-UV920P-A for a low cost, low power cross-band repeater can save a lot of money on two way communications. As with many mobile two way radios, the KG-UV920P-A can be programmed in one of two ways, either direct from the console on the front panel of the radio, or through a computer via programming software. Technically speaking, there is a third way. The radio can also be programmed directly from the DTMF keypad on the hand speaker mic. While not impossible, programming direct from the radio can seem daunting, not so much because it is, but because of the sheer number of configuration options available. An evening with the owner's manual is helpful, but may not be particularly enlightening on the first read. However, it may be well worth the time and effort to learn, just in case you ever need to add a channel or two on the fly. The menu consists of 45 items. Default settings are bold. The Wouxun programming software isn't the greatest application, but it's really not too bad, considering the alternative, which is to program the radio directly from the keypad. The USB programming cable connector is somewhat specific for this mobile radio, so it isn't something you can freely swap out with other mobile transceivers. The Wouxun programming software is also specific to this model and is currently available for Windows PCs only, but it is available as a free download from Buy Two Way Radios. While not particularly intuitive, the software isn't that complicated, either. If you have programmed a two way radio before, it is somewhat self-explanatory. The USB cable driver needs to be installed first, which can become a challenge if the Wouxun KG-UV920P-A cable driver installation instructions are not properly followed, but once it is set up and the cable is working, it is ready when you need it. The detachable front panel of of the KG-UV920P-A can be mounted inside your vehicle almost anywhere you need it for instant access and ease of operation. The console on the front panel includes an LCD display with a selectable three color backlight, channel knobs, volume knob and the equivalent of a DTMF keypad spread out across the face of the console. In effect, every operation that can be performed from the keypad on the speaker mic can also be initiated from the front panel of the radio. The Wouxun KG-UV920P-A is a feature rich mobile radio at a value price. When you add in the cross-band repeat functionality, it's really quite a bargain. This entry was posted in Articles, Wouxun and tagged programming, Wouxun, KG-UV920P-A, menu options on May 18, 2016 by Rick. We discuss the basics of using Amateur or Ham radios. We also review the Baofeng UV-5R Dual Band UHF/VHF Amateur Radio. we talk about amateur radios. We recap the The 2013 Charlotte Hamfest, learn the basics of the Amateur Radio Service, find out how to obtain an amateur radio operator license and discuss the types of amateur radios available. For more information about the hamfest listen to Episode 53 of The Two Way Radio Show recorded almost live from our booth at the 2013 Charlotte Hamfest at The Cabarrus Arena and Convention Center in Concord, NC. Study materials mentioned for the amateur radio license exams include Ham Radio For Dummies and the Ham Radio License Manual Revised 2nd Edition w/ CD. For more information about the American Radio Relay League visit The ARRL. Download our FREE chart of Q Signals. For tips on using your two way radios, watch our Radio 101 video series hosted by Anthony. Today we review the popular Baofeng UV-5R Dual Band UHF/VHF Amateur Radio. Questions from readers of our Two Way Radio Blog and members of the Two Way Radio Forum. © 2013 Cricket Ventures, LLC. All rights reserved. This entry was posted in Two Way Radio Show Podcast, Ham Radios and tagged UHF, VHF, 2013, license, programming, accessory, accessories, amateur, ham, Mecklenburg, Charlotte, Hamfest, HF, technician, general, extra, exam, testing, call sign, Amateur Radio Relay League, ARRL, morse code, DX, DXing, Baofeng, UV-5R, dual band on March 25, 2013 by Rick. Radio 101 - Are GMRS radios user programmable? A commonly asked question by new users of walkie-talkies is about programming consumer FRS/GMRS radios. Are GMRS radios user programmable? In this episode of Radio 101, Anthony from Buy Two Way Radios gives you a fast, matter-of-fact, no-nonsense answer. This entry was posted in Consumer Radios, Radio 101 and tagged radio, two-way, radios, 2way, FRS, GMRS, channels, consumer, channel, programming, walkie-talkie on February 11, 2013 by Rick. If you find yourself having to change radio settings every time a new radio is added to your fleet, you can probably save yourself a lot of time by learning how to clone your Motorola RDX radios. The cloning process simply copies the settings from one two way radio to another, and can be done in 3 ways. NOTE: For cloning to work successfully, the radios must be the same model number. If you already have a Motorola RLN6309 RDX multi-charger, then you're in great shape! The RLN6309 has built-in support for cloning, and the process couldn't be simpler. 1. Be sure both the Source and Target radios have charged batteries. The multi-charger does not need to be connected to a power source. 2. Place the Target radio (the radio that needs to have settings updated) in Pocket 1 on the charger and turn the radio ON. (Pocket 1 is on the far left when you are facing the Motorola logo). 4. Place the Source radio in Pocket 2 of the multi-charger. 5. Press and release SB1 on the Source radio to initiate cloning. A chirp sound confirms cloning was successful, a bonk sound is heard if cloning was not successful. 6. Turn both radios OFF and then ON to exit cloning mode. You can also clone two Motorola RDX series radios by purchasing a Motorola RLN6303 Cloning Cable. The RLN6303 allows you to connect two chargers together, and allows for radio to radio cloning. Before getting started, be sure that you have a fully charged battery in each radio. Also, please note that the chargers will not need to be connected to a power outlet. 1. Unplug any power or USB cables from the chargers and connect them using the cloning cable. 2. Place the Target radio (the radio that needs to have settings updated) in one of the chargers and turn the radio ON. 4. Place the Source radio in the empty charger. You can also use the Motorola RDX programming software to essentially copy the settings from one radio to another. 1. Download the Motorola CPS software and purchase a programming cable (instructions here). 2. Connect a radio charger to the PC using the programming cable and launch the software. 3. Turn Source radio (the radio to copy from) ON and place it in the charger. 4. In the software, click the "Read Radio" button on the toolbar. This downloads the configuration from the radio. 5. Turn Target radio (the radio that needs to have settings updated) ON and place it in the charger. 6. In the software, click the "Write Radio" button on the toolbar. This uploads the configuration that was previously read to the new radio. 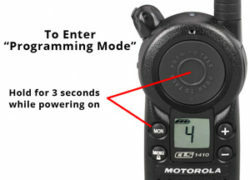 These instructions apply to all two way radios that are part of the Motorola RDX series. Models include RDU2020, RDV2020, RDU2080d, RDV2080d, RDU4100, RDV5100, and the RDU4160d. This entry was posted in General, Two Way Radios, Articles and tagged two, way, radio, Motorola, RDU2020, charger, Multi-Charger, RDX, programming, cable, software, RDV2020, RDU4100, RDV5100, RDU2080d, RDV2080d, clone, cloning, CPS, RDU4160d RLN6309 on May 2, 2012 by Rick. If your business has a large fleet of Motorola RDX two way radios or has to adjust the radio settings every time a new radio is added, you can save a considerable amount of time by using the RDX series programming software. This software makes it incredibly easy to adjust the settings of a radio. You can also save a profile, and when you add a new two way radio you simply need to open the saved profile and click a toolbar button to write the profile to the new radio. Much simpler than using the radio's menu, especially on models without a display (such as the RDU2020, RDV2020, RDU4100, and RDV5100)! Even if your radio has a display (RDU2080d, RDV2080d, RDU4160d), the programming software still makes the process quicker and saves time. The software itself is free and the latest version can always be downloaded directly from Motorola's web site at http://www.motorolasolutions.com/rdx. You will, however, need a programming cable: the Motorola RKN4155. This cable connects to the port on the back of the radio charger, and then into a USB port on your PC. Unfortunately, this cable is proprietary, meaning a standard USB cable will not work. This entry was posted in General, Two Way Radios, Articles and tagged two, way, radio, Motorola, RDU2020, RDX, programming, cable, software, RDV2020, RDU4100, RDV5100, RDU2080d, RDV2080d, RDU4160d, RKN4155 on May 1, 2012 by Rick.